Last year I posted a recipe for my first foray into kimchi making: kkakdugi, or daikon kimchi. Since then, I have acquired The Kimchi Cookbook by Lauryn Chun. The book features a great assortment of both traditional and experimental kimchi recipes, as well as recipes for kimchi-inspired meals. With all the wonderful recipes in the book, I’ve managed to use it twice, and both times I made the most traditional kind of kimchi– the kind you can buy anywhere. You can call me boring, but it is a perfect recipe, and when I taste perfection, I’m not immediately inspired to look further. Chopping the cabbage. 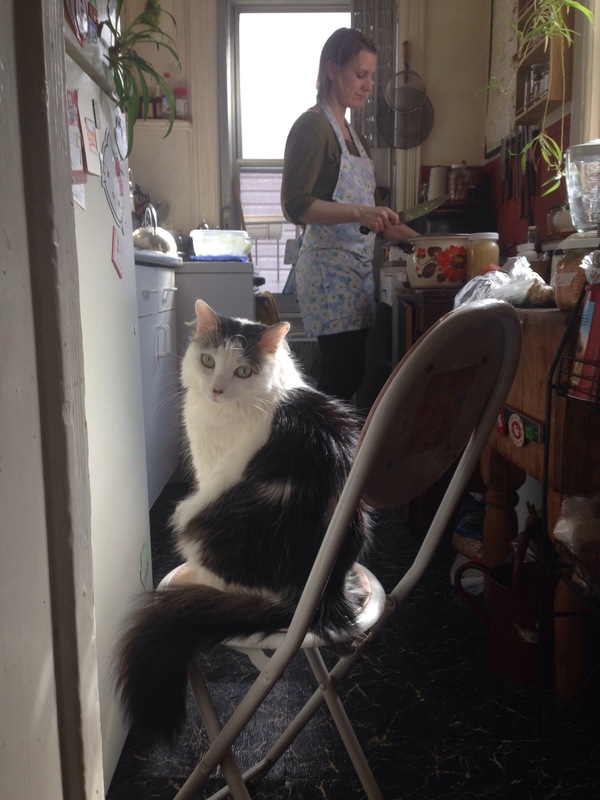 Cats are very helpful kimchi-making overseers. The hardest and most culturally enriching part of making this kimchi was finding some of the traditional Korean ingredients. Anchovy sauce, salted shrimp, and Korean chili peppers don’t just hang out on the shelves of any neighborhood grocery store. A store by me that carries The Kimchi Cookbook and many fermenting supplies and ingredients sells ready-made kimchi paste, but not the building blocks to assemble one’s own. Lame. 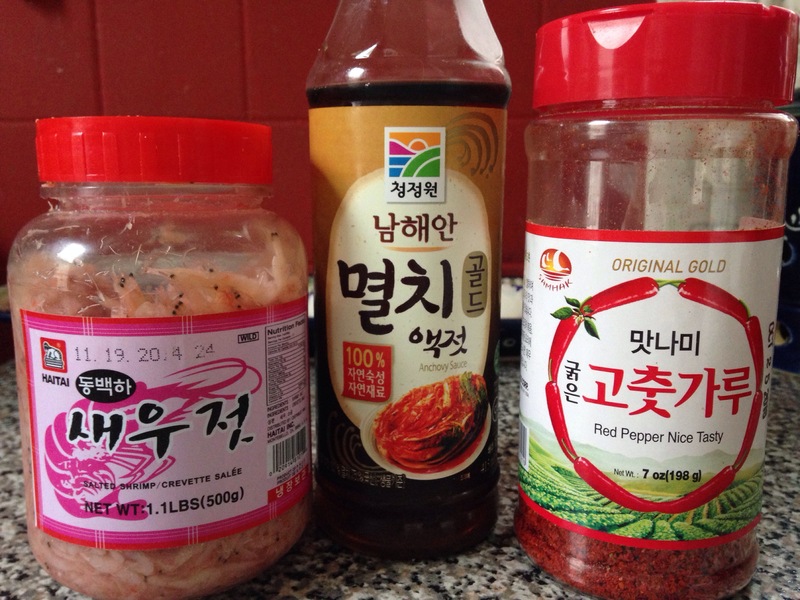 If I’m making kimchi from scratch, I want to do it ALL the way! Koreatown on 32nd street between Fifth Ave and Broadway in Manhattan is your best bet if you in the NYC metropolitan area. Halfway down the North side of the block, there is a food store. When I stepped into the store, a clerk immediately asked if I needed help. I stood out like a sore thumb, being the only non-Korean in the joint. Amidst the endless bottles of fish sauce and soy sauce, I would have never found the anchovy sauce without his help. The chili flakes and salted shrimp were more obvious. My below recipe is adapted to a slightly larger amount than what is listed in the cookbook, mainly because I have a big fermentation crock and I like to fill it up when I use it. The hard-to-find authentic ingredients. Aaak! The shrimp and their little eyes! 1. Rinse 2 large heads of napa cabbage. (6 lbs +) Cut them into long quarters, remove the core, and chop them into 1-2 inch, uniform as possible square pieces. 2. Place the chopped cabbage into a large bowl. It will take up a lot of space, so you may need two bowls. Sprinkle 1/3 cups of kosher salt onto the cabbage and mix it up. Let the cabbage brine in the salt for an hour or more. 3. 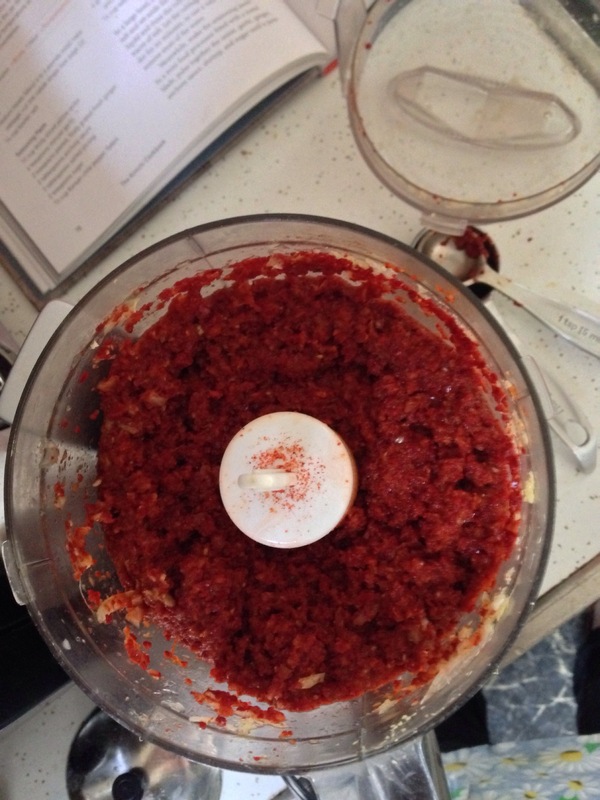 Meanwhile, make your kimchi paste: In a food processer, combine 1 medium onion, sliced, 6 cloves garlic, coarsely chopped, 1 generous inch of peeled fresh ginger, grated, 3 Tbsp of anchovy sauce, 3 Tbsp salted shrimp, 3 tsp sugar, 3/4 cup of Korean pepper. Process it into a pulp. 4. Rinse the salt off the cabbage. Drain it well in a colander or with a salad spinner. 5. Combine the cabbage with the kimchi paste, and mix in the green parts of 8 scallions or a few green onions, cut into 2 inch pieces. 6. 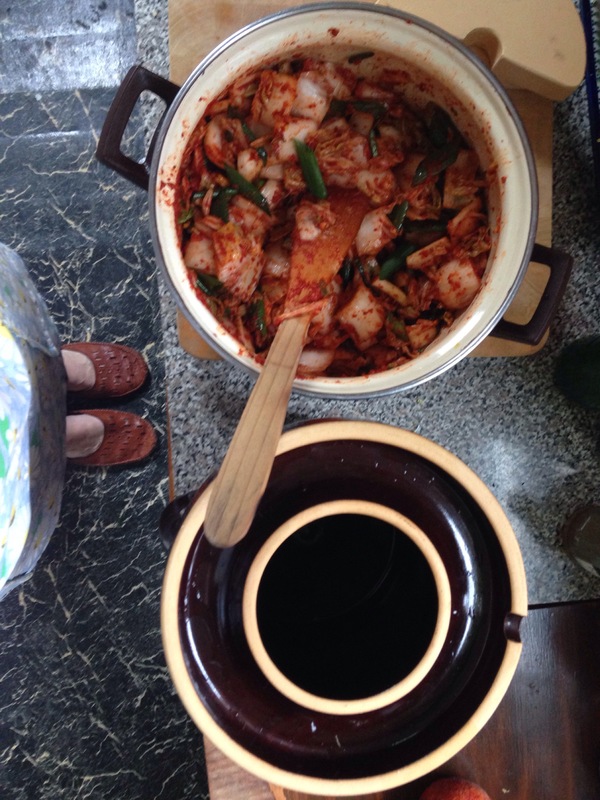 Pack your kimchi tightly into your fermentation vessel, adding water as necessary to submerge the kimchi. Cover, and let it sit for three days at room temperature. 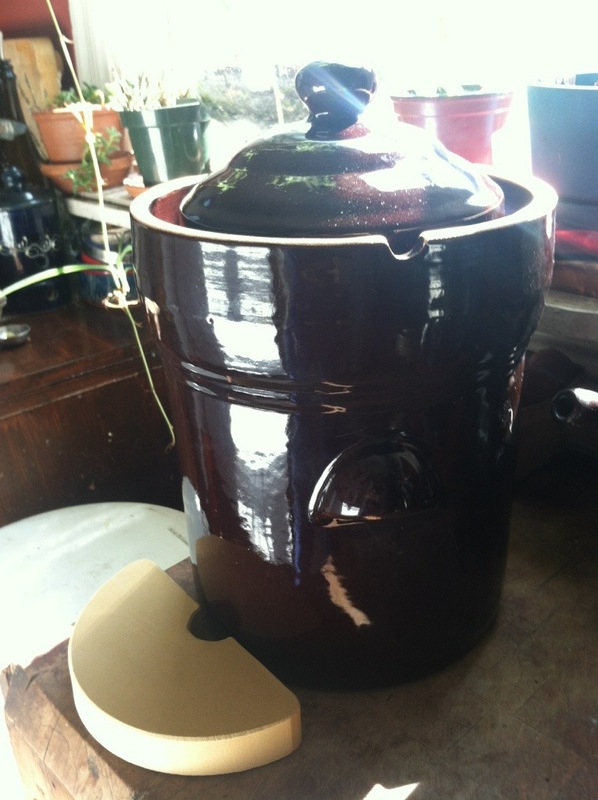 Your fermenter could be a pickling crock or simply a large mason jar (or two). This recipe will yield 2-3 quarts of kimchi. As it ferments the kimchi will expand, so place your jar on a plate to catch possible overflow. After this point, it is ready to consume. Store the kimchi in your refrigerator. It will continue to ferment slowly and will last for many months, maturing in taste over time. So what does a brooklyn alewife get for her birthday? Fermentation toys! I have a few new toys to show and tell about. The two big pieces of equipment are definitely unnecessary for a beginner fermenter– I’ve gotten along without them for a few years now. My birthday crock! That thing on the left is a weight to hold the veggies under the brine. Recently I wrote about a failed moldy cucumber pickle recipe, and in response to that experiment, my love answered my desires and got me a birthday crock! No more moldy pickles! Mine’s 5 L, which is as big as I think I’ll ever need, unless I start selling pickled things commercially. Woohoo! 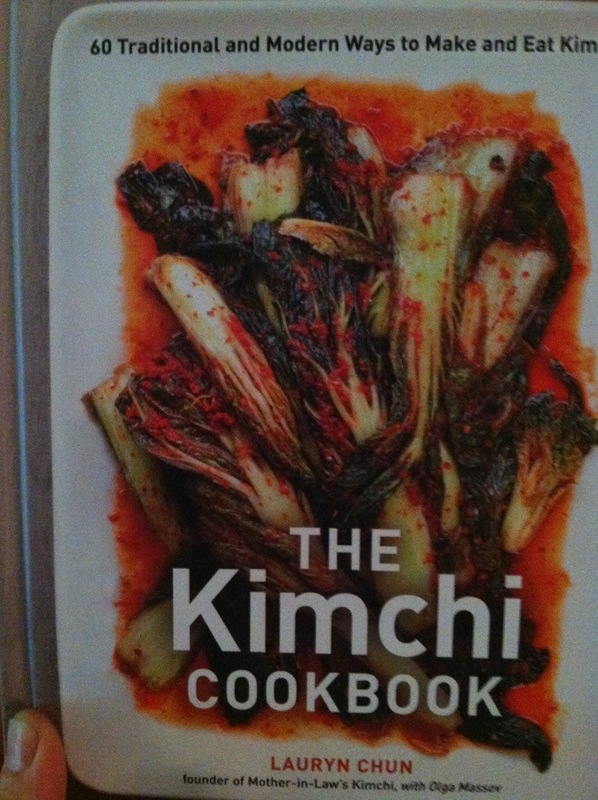 The Kimchi Cookbook: written by a fellow Brooklyner. Her kkakdugi recipe is a little different than mine. Probably more sophisticated. Along with that, he bought me the pretty new kimchi cookbook. I have some playing to do! I’ve already learned a few things about kimchi. Chun’s brining process begins the fermentation for generally an hour to overnight, then she rinses all the salt off the veggies and adds her spice mix, and lets them ferment longer in that. The only salt in the spice mix tends to be in some anchovy sauce, from what I can see, and then there is sugar added for the ferment. Interesting. My kkakdugi kimchi was brined and stayed in brine… so this is a new approach for me, which is probably a bit lower in sodium. A self-gift that I got in early summer (for my, errr, 3/4 birthday?) 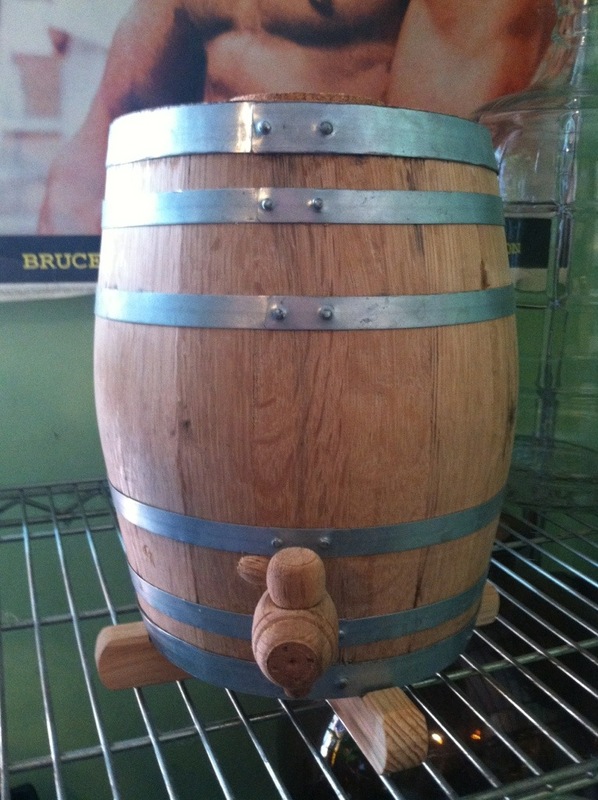 is an oak barrel for brewing kombucha in, from a company that custom-makes them down in Texas. The company sites this model of upright barrel for either vinegar making or kombucha. The barrel method is my first attempt at a continuous brew batch. It seemed like the best idea in the world when I got it, and it does impart a nice oaky flavor to my brew that I quite like. What I don’t like is that it’s much harder to see what’s going on deep in the container, which makes me in general a bit less attentive to my brew. It’s not something you can fully clean out so well either, as the wood is porous, so after a year or so it’s supposed to expire. I’m not sure I would go with it again. My 5 L barrel was $70, and you can decide whether that investment is worth it in your own experimentation. I was very happy with the service from the company I ordered from: Oak Barrels Ltd.
5L oak barrel that I have a continuous kombucha ferment in, since June.